Ben White celebrates his goal for Posh against Southend. Photo: Joe Dent/theposh.com. On-loan Peterborough United defender Ben White believes clean sheets will be the key to the club’s promotion hopes. White scored his first Posh goal - and his first for 16 months - in Saturday’s 2-0 win over Southend at the ABAX Stadium. 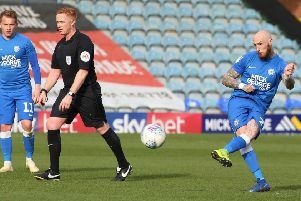 The win moved Posh back into the League One play-off places, although they will drop out of them again tonight (March 26) if Doncaster collect a point from their home match against in-form Bristol Rovers. But the comfortable clean sheet - Southend didn’t register a shot on target all match - was just as pleasing to the 21 year-old Brighton defender. “We’re looking to build from the back and if we keep a clean sheet we believe we will win because of the attacking quality in the side,” White said. “We had a hard look at ourselves in the week leading up to the Southend game. There was a bit of a back-to-basics approach and happily it worked out well for us. “The attention to detail the new gaffer gives is impressive. He’s given me plenty to work on and told me where I neee to improve and I’m enjoying it. “I had seen video clips of the Southend ‘keeper spilling shots so I followed Marcus Maddison’s shot in and managed to score as a result. “Obviously that was a pleasing moment for me, but the clean sheet was just as pleasing. “I’m learning from everyone I’ve played alongside this season. It was the same on loan at Newport last season. Improvement is always possible. White’s only other professional goal arrived in a 2-1 home defeat for Newport against Barnet in November, 2017. Posh could be ninth before they return to League One action at home to Gillingham on April 6. That would require Blackpool to win at home to Plymouth on Saturday (March 30) and Coventry to win at second-placed Barnsley on the same afternoon. Doncaster are at home to lowly Walsall on Saturday.